You can watch the film this weekend in the Paris Lift-Off Online Festival Vimeo.com/ondemand/parisonlinefeatures Do please watch it if you havent, and recommend it to your contacts. There is a small fee – I think its Eur 12- but this allows you also to preview a stack of other new documentaries. You can vote for the Calais film and if we win, we will get a major screening in Paris which I can use to mobilise lawyers and activists and NGOs there. We’re currently only 8 votes short so you can make a difference ! Thanks! Event ends tomorrow Sunday night at midnight. Great news that Safe Passage won their case on Appeal. This was to criticise the Home Office for not acting quickly enough on Dublin lll, the EU regulation that says unaccpmpanied minors in Europe with families in another European country (in this case UK) should be allowed to proceed to that country to have their case heard there. Home Office did not advise thse young people correctly, actively restricted their claims under EU regulation, and then did not present full information to the court at prior stages of the hering. Great that the Appeal court ruled in their favour. An important legal victory in the Court of Appeal has advanced the work of a filmmaker and campaigner from Goldsmiths, University of London. Sue Clayton with some of the Calais children. Professor Sue Clayton has been campaigning for two years on the issue of the child refugees who were left abandoned in Calais despite the fact that many had a strong legal case to be brought to safety in the UK. Today (3 October 2018), following a challenge brought by charity Help Refugees, judges ruled that a number of child asylum seekers assessed for transfer to the UK under Section 67 of the 2016 Immigration Act – known as ‘the Dubs Amendment’ after its proposer Lord Alfred Dubs – were given “patently inadequate” reasons for being refused entry. The decision means that the case of 37 children Sue identified in the Calais Jungle can move forward. Her film Calais Children: A Case to Answer has been screened over 200 times in six countries, and formed the basis of a legal challenge brought by her team at Duncan Lewis Solicitors, and heard in the High Court in February and March this year. Sue said: “It’s been so frustrating having our judgment held for over six months while the Help Refugees case was settled. But the success of their judgment today is fantastic news. It means that the principle of the Home Office having acted unlawfully has been established by the court. “Now we hope our case, which involves “ZS”, our lead client from Afghanistan, and 36 others, from war-torn countries with the youngest aged nine, will follow the same route and bring safety to these 37 kids who are waiting for a positive outcome. 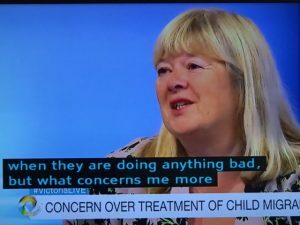 Sue Clayton was interviewed on France 24 TV Global “Perspectives”, and screening of extract of CALAIS CHILDREN in September 2018. Teresa Casal has completed the Camino de Santiago in support of CALAIS CHILDREN. You can still support her here. Cuando se estableció el arrasamiento de la Jungla el octubre del 2016, se encontaban allí más de1.900 menores abandonados – muchos de los cuales tenían un caso legal para entrar en el Reino Unido . Sue luchó para conseguir que los reconocieran y examinaran sus casos; pero con la destrucción por las llamas del campo de refugiados ¿iba a tener tiempo de llevarlo a cabo ? Y¿ qué les iba a pasar a los menores si no ? Lo que ocurrió después constituye un capítulo vergonzoso en el historial de Derechos Humanos del Reino Unido, retrasos que los menores sufrieron,rechazos y desestimaciones por parte del gobierno británico, y al final abandono en Francia sin ningún tipo de apoyo. LOS NIÑOS DE CALAIS- LA HORA DE LA JUSTICA sigue a los menores durante un año desde que dejaron la Jungla, entrevista a Lord Dubs, a los grupos de voluntariado y a los abogados con los que Sue reta al Ministerio del Interior en El Tribunal Superior en feb/marzo del 2018. Con vuestra ayuda Sue continúa luchando por ellos. 12th July 2017 Twice on the news today! The Butler-Sloss report on Trafficking is out so I’m back in Calais, working with ITV News (at 10) http://www.itv.com/news/2017-07-12/vulnerable-lone-child-refugees-have-been-failed-by-british-inaction-says-report/ and C4 News https://www.channel4.com/news/migration-crisis-are-we-fuelling-people-smuggling to get items out this evening Weds. Its horrendous- there are now several hundred kids back here, and they are sleeping in the woods, in pouring rain. They are constantly harassed by the CRS (riot police) who spray then with gas and with pepper spray. They also spray their blankets/sleeping bags/tents if they have any (given by Auberge des Migrants) with pepper spray which makes them unusable. Every night. No-one seems to think about a future plan for these young people. A daily round of sleeping in the wet, being shocked awake in the night by copes, hounded around the industrial waste land of Calais, (They’re not allowed to sleep ! as that would count as them being ‘resident’) then they spend the later day trying to get on trucks, trying to get anywhere that might not turn them away nor treat them like animals or crimials. Its one of the worst things I’ve seen on all my trips. We have to keep pushing to get a resolution. Dear all thanks so much those of you who’ve got to screenings ! See more listed at the side for July 11th and 18th. The film is also going to be svcreened in Parliament and a number of other ways it will have real impact. All very very best everyone! Here are a list of our PAST SCREENINGS in reverse-chronological order. June 2nd, 5-6:30pm, Screening + Q&A following an all-day event, see details. St Chad & St Mark Church, Lime Street, Wolverhampton. of ‘Health and Welfare Inequalities’ Conference at Leicester DMU. 7pm Backhaus & Co. Fargo Village, Far Gosford Street, Coventry CV1 5ED. Sat 17th Feb. Plymouth Quaker House Stand Up to Racism 2pm-5pm at Quaker House, 74 Mutley Plain, Plymouth PL4 6LF. Afternoon: Screening of CALAIS CHILDREN , and lecture by Sue Clayton- more details soon. 2.30-4.30 Arts Building Royal Holloway University of London Egham Hill Egham Surrey TW20 0EX Contact claytonworks@gmail.com if you are a social worker and wish to attend. Ne discutono Gabriella D’Agostino e Alessandra Rizzo (Università di Palermo). Sarà presente la regista. Screening of CALAIS CHILDREN and discussion hosted by Fences and Frontiers group. Screening of CALAIS CHILDREN and discussion with Sue Clayton Hosted by JCORE befriending project for unaccompanied young asylum-seekers. Screening of CALAIS CHILDREN. Panel with Sue Clayton and local young refugees. CALAIS CHILDREN runs continually in the exhibition. Screening of CALAIS CHILDREN and panel discussion. 8pm CALAIS CHILDREN screening plus debate. Anyone interested in attending, do contact the website and we will get you invited. The film will be shown and short talk by Sue Clayton- not yet listed in the programme- will be soon. CALAIS CHILDREN: A CASE TO ANSWER. This is a unique opportunity to see this ground-breaking film which will be introduced by Sue Clayton (Director) and followed by a Q & A session. Can Films Change Public Policy and the Law?